When it comes to workplace injuries, most attorneys tend to focus on the big, flashy cases—falls, catastrophic traffic collisions, and deadly chemical exposures. However, one type of injury that ironically gets overlooked—even though it can happen in nearly any job—is damage to one or both eyes. Eyes are incredibly sensitive and vulnerable to both injury and infection. A physical eye injury occurs when an external object—glass, wood, metal, or fluids—enters the eye or causes blunt force trauma to the socket. The mucous membranes that surround the eye are also prime places for toxic chemicals and viruses to enter the bloodstream. These injuries are incredibly painful and can impact the victim’s ability to work and his overall quality of life. 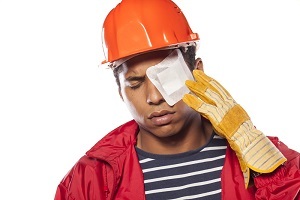 The danger is so great that, according to the Centers for Disease Control and Prevention (CDC), every day about 2,000 U.S. workers suffer a job-related eye injury. The two most sensitive environments to sustain eye injuries are those where chemicals, building materials, and bodily fluids are abundant—the health care field and construction/industrial sites. Health care. Health care workers are exposed to a variety of illnesses through their patients. Although diligent hygiene and routine glove use are encouraged to help ward off these risks, they just aren’t enough. When your job exposes you to splash or airborne fluid risks (such as blood, respiratory droplets, and vomit), you need proper eye protection. In fact, your employer is required to provide you with equipment (goggles or glasses) as well as emergency training for when a patient’s fluid comes in contact with your eyes. If you’re concerned about the current infection control measures at your workplace, speak up! Eye protection is just as important as respirators, gloves, and masks in keeping you safe. Construction and industrial work. Some of the most devastating injuries linked to construction accidents involve the eyes. Nails, metal pieces, wires, and chemicals can all lead to serious eye injuries. An eye injury can cause permanent damage and may result in blindness, changing the life of the injured construction worker forever. Due to the immense eye risk on construction sites, eye protection is required for employees. Furthermore, contractors and supervisors violate federal guidelines when they fail to provide adequate eye protection. Most people’s jobs rely heavily on good eyesight, so if you suffer a serious injury, you may be facing significant time away from work. While accidents happen, your employer has a duty to protect you from harm. With this duty comes an obligation to protect your eyes just as much as the rest of your body. Therefore, personal eye protection equipment (goggles, safety guards, and protective screens) and emergency equipment must be provided whenever a risk of eye injury is present. This is not just common sense; it’s a requirement from the Occupational Health and Safety Administration (OSHA). When proper steps aren’t taken to protect you and your coworkers from blinding eye injuries, you must speak up and report your employer to OSHA. If you have suffered a work-related eye injury as a result of employer negligence, you may be entitled to compensation for your injury. The Texas Workers’ Compensation Act of 1989 established four types of income benefits in which you may be eligible. Temporary Income Benefits (TIBs). These benefits are paid to the worker while he’s recovering from a workplace injury. Impairment Income Benefits (IIBs). These are benefits paid to injured workers for injuries that caused permanent impairments (based on guidelines developed by the American Medical Association). Supplemental Income Benefits (SIBs). These benefits are paid to augment injured workers’ lost wages due to impairment. SIBs go into effect after the limited amount of income impairment benefits (IIBs) have been exhausted. Lifetime Income Benefits (LIBs). Lifetime benefits will be paid to the injured worker for specific catastrophic injuries, such as total and permanent loss of sight in both eyes. A portion of LIBs may be awarded for partial loss of vision as determined by the severity of the injury. For more information on how to pursue a claim for you eye injury, contact attorney Steve Lee, an experienced workers’ compensation lawyer, at 713-921-4171. He’ll review your case FREE of charge and help you determine the extent of your claim. Don’t allow yourself to be blindsided by your employer; call now to secure your rights!